One of our primary goals in the East Whittier City School District is to ensure that each child has every opportunity to achieve personal and academic excellence in every endeavor. 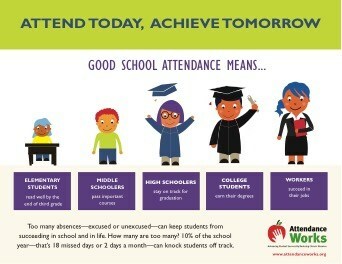 On time, daily attendance is an easy way to support this goal. Because your child’s future is important we have included attendance information that you should know in regard to your legal responsibilities so that we can work together as a team to support your child. Students are considered present for that day if they are engaged in academic instruction and learning for any portion of the day. This means that a student who is sent home by the health office, due to illness or injury, is not marked absent for that day. A student is considered present for the entire day when attending any “fraction” of the scheduled school day. In order for a student to be counted as present, there must have been intent for the pupil to attend school that day. The student must have been engaged in instruction and been under the immediate supervision of a credentialed District employee. Students who come to school solely to turn in completed work or projects or to receive work to complete are not considered present for that day of school. Attendance at an educational conference on the legislative or judicial process offered by a nonprofit organization. For the purpose of spending time with a member of the pupil’s immediate family, who is an active duty member of the uniformed services, and has been called to duty for, is on leave from, or has immediately returned from, deployment to a combat zone or combat support position. Attending the pupil's naturalization ceremony to become a United States citizen. If you are scheduling medical appointments, it is in your child’s best interest if you can make them before or after school so as not to interrupt their learning. However, we realize that this is not always possible. Therefore, if your child would receive at least one hour of instruction before or after the appointment, then your child should be in attendance at school during that time. 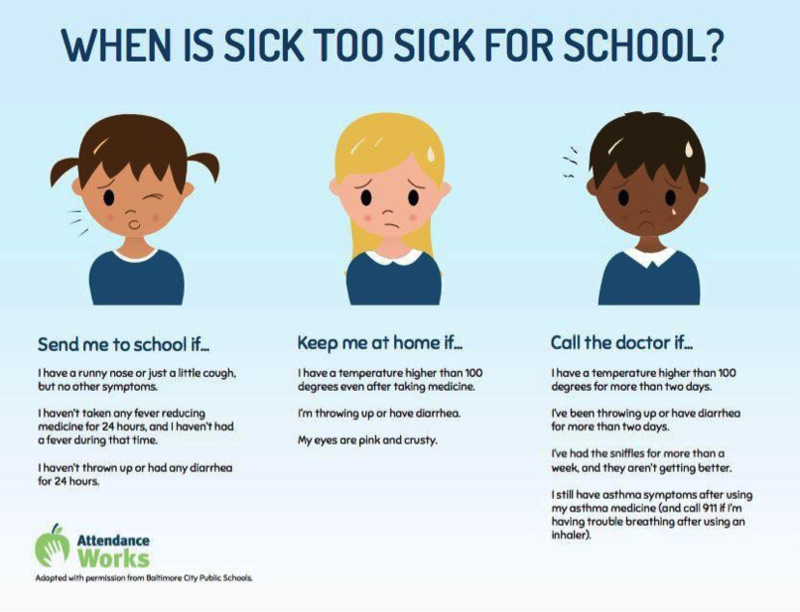 If your child has a doctor’s appointment, they will not be excused for an entire school day. 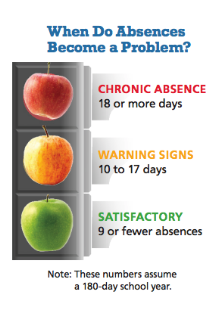 Students who have been absent 5 or more consecutive days due to illness must present a doctor’s note verifying the illness in order for the absences to be excused. This means that up to four consecutive days may be excused with only a parent note. Starting on the 5th day of absence, there must be a doctor’s note in order for that day, or any subsequent days, to be excused. If your family has religious beliefs that may conflict with holiday activities at your school, please discuss this, in advance, with your principal. An alternative activity will be arranged so that your child does not miss an entire day of instruction. Also, it is a parent/guardian’s responsibility to ensure that the appropriate school personnel receives the verification of absences. The parent/guardian should assess the maturity level of his/her child to determine if he/she should be responsible for turning in absence verifications or if it would be more secure for the parent/guardian to submit the verifications to the office or call the office directly. When students return to school after an absence, they must present a satisfactory explanation verifying the reason for the absence within one week of the date of the absence. Verifications not received during this period are considered unexcused and will not be changed. The East Whittier City School District has a partnership with the Los Angeles County District Attorney’s Office to implement the Abolish Chronic Truancy (A.C.T.) Program. The District Attorney’s Office monitors the attendance of our students and requests that any student with 15 or more absences in one school year or 10 or more absences in one trimester be referred to A.C.T. Absences that have been verified by a doctor’s note are not included in this total. Absences prior to the date of the doctor appointment will not be excused. Because it may be difficult to get a same day appointment or it may be a financial hardship to access medical services, we also provide the option for you to see the school nurse. Absences before the date that the student sees the school nurse will not be excused. If you were to call or write a note stating that your child was ill once he/she was placed in the A.C.T. Program or on “Medical Verification”, the absence would be considered unexcused. A student who has 3 or more unexcused absences in a school year is classified as a truant by California state law. If you know, in advance, that your child will be absent from school 5 or more consecutive days, it is requested that the parent consider enrolling the student in the Independent Study Program. It is important to give the school at least two week’s notice that you are interested in this program so that they can make appropriate arrangements. Please contact Lorena Duran, Director of Student Services, at 562-907-5931 if you have any questions or need assistance.